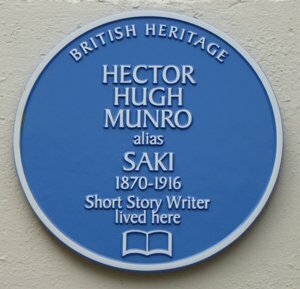 A blue plaque has recently been placed on the wall of Fairfield (formerly part of Broadgate Villa) in Bellaire, Pilton, to commemorate the life of short story writer Hector Hugh Munro, alias Saki, who lived there at various times during his life. Hector was the third child of Scotsman Charles Munro and Mary Frances Mercer, and was born in Burma in 1870 where his father was an officer in the military police. All three children were of uncertain health, Hector in particular. When Mary became pregnant again in 1872, the family returned to Pilton, where Charles Munro’s widowed mother lived with her two unmarried daughters, Charlotte and Augusta. Unfortunately in early 1872, Mary Munro and her unborn child were killed by a cow and the three motherless children became the unexpected charges of their grandmother and aunts. In 1893, in his early 20s, Munro joined the Colonial Burmese Military Police in Burma. Ill-health caused him to return to England only a year later and he embarked on his career as a journalist and writer, working for many different newspapers and journals. He also published a number of collections of the often acerbic short stories for which he is best known. At the age of 44, Munro enlisted in the 22nd Battalion, Royal Fusiliers, declining a commission and rising to the rank of Lance Sergeant by September 1916. A month later he was fatally shot by a German sniper’s bullet but has no known grave.